A beautiful example of Finley's important 1827 map of Illinois. Depicts the state with moderate detail in Finley's classic minimalist style. Shows rivers, roads, canals, and some topographical features. Offers color coding at the county level. Title and scale in lower left quadrant. 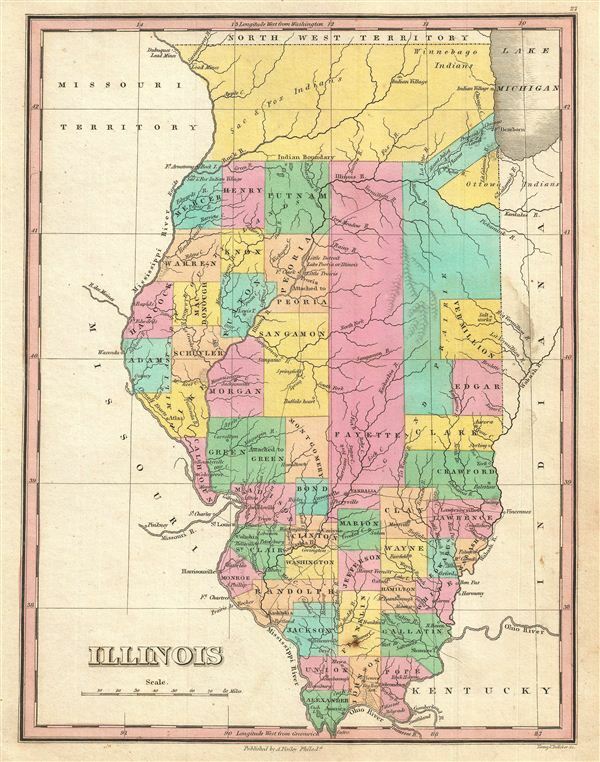 Finley's map of Illinois is particularly interesting and important due to its portrayal of the rapidly changing American Indian situation in the northern part of the state. In 1827 northern Illinois was a confined territory assigned to Sac & Fox, Ottowa, and Winnebago Indians. It is interesting to note the commercial interests of European settlers divides the otherwise singular American Indian lands to provide river access to Chicago and Lake Michigan. Within a few short years of this map's construction, most of these tribes were forcibly removed to the Indian Territory or Oklahoma. This map was updated yearly from 1824 to the mid-1830s. A full series of these maps is a powerful illustration of both the American Indian relocations and the Westward Expansion. Rumsey 0285.027 (1831 edition). Phillips (Atlases) 4314, 760, 752, 6045.